Its the 17th day of the Year 2014, can you believe it? It feels like the days are just hours now you blink and its gone. So I have decided to make every effort to make a Resolutions list and be proactive in making get them done. Can I ask a question? How many of us have already strayed from the New Year's Resolutions we made just two weeks ago? You are not alone! Honestly I have strayed a little of track myself. When we strive for something new and exciting in our lives we get all motivated, and a fresh new year is the perfect opportunity to begin and by the 3rd day we are back to our old habits. Resolutions are actually actions we need to take to change our lives, however it requires effort and discipline. Something I have been learning this week as I have decide and currently take it step by step on the road to be a better me. Resolutions are just a list of goals that you make at the beginning of each year, but what many of us forget is that you are you and the new year does not make you change, you have to put forth effort and change your life for the better. 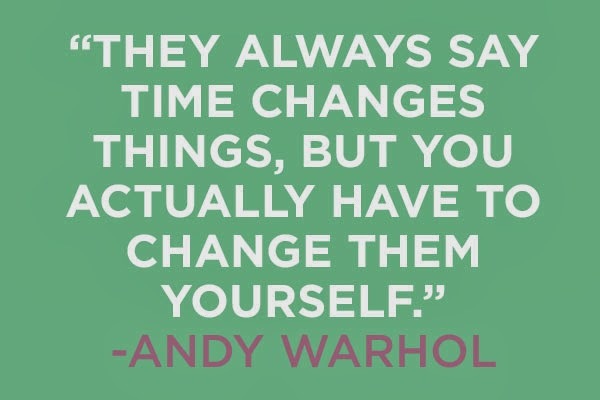 Andy Warhol makes a great point, " They Say time changes things but you have to change them yourself" Isn't that so powerful. You have to make the change you want to see in your life. Ghandi said, be the Change you want to see in the world. These are both powerful statements that motivate me to push past my old habits for the new habits I want to have and as a result I will be better in the Year 2014. 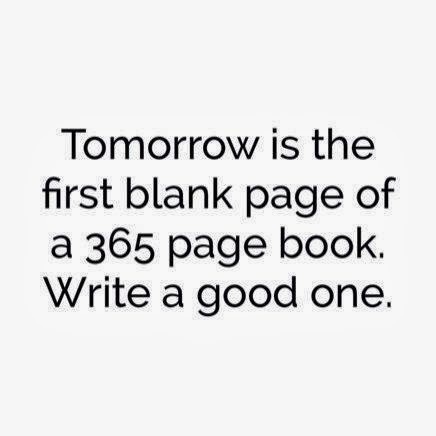 Another thing I've realized is that we can't just write our resolutions on paper hope that we will do them. This is called Procrastination. I have a blog post I did last Fall on this subject. Writing them down and actually actively pursuing them are two different actions and once we realize this then I know we can make the changes we need to in our lives. The goals have to be scheduled and planned and set time aside to complete. The goals need to be in our minds everyday and week as we go through each day, week and month of 2014. Lets think of our resolutions as promises we make to ourselves and then we will be inspired to follow through and keep them. Here's a video that inspired me to for my goals and dreams I have for myself this year. So Here is the a list of my 2014 Resolutions and Promises. The overall theme for 2014 is to do and be better in all areas of my life. Be the best version of me to others and myself. I hope this year is different and you get all your goals and dreams accomplished and that this year will be your best year yet.